What’s the point of owning a house when you don’t get a single trick-or-treater? We were prepared with a bowl full of gummy bear packets and organic, corn syrup-free Oregon-approved lollipops. 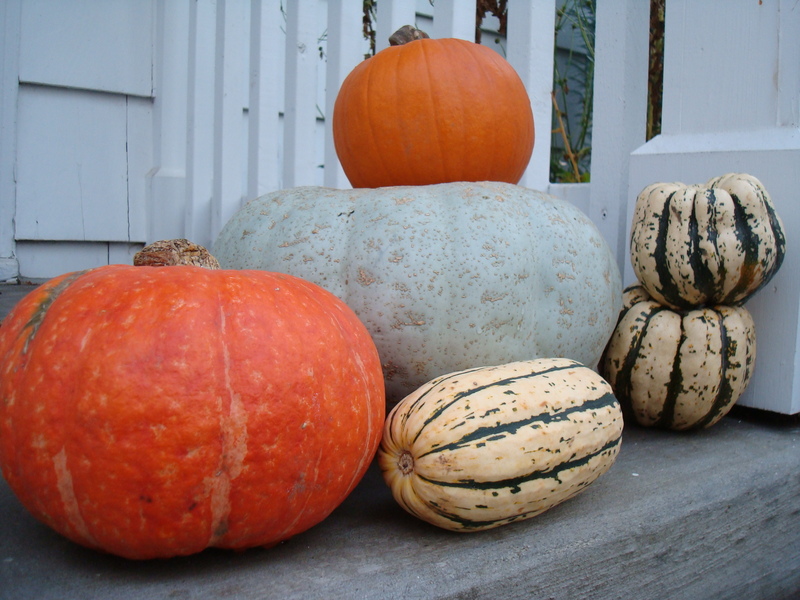 I propped several kinds of pumpkins up on our front stoop (we didn’t carve them…hoping to make pie with them instead). But not a soul came by. Perhaps we’re too much of an outlier, too close to the smelly Oregon State dairy farm. Or perhaps the kids had their fill treat-or-treating earlier in the day at businesses downtown. Growing up in Richmond, our long driveway scared trick-or-treaters away. And they didn’t bother us at our apartment in Baltimore. I guess they won’t here either. maybe the kids got wind of the fact you were handing out organic lollipops! Did you get any trick-or-treaters? It really is over-rated, right up there with New Year’s. Although I’m excited about our New Year’s in San Fran this year! Halloween is fun! We get a ton of trick-or-treaters… in fact we have run out of candy for the past two years. And we bought A LOT this year! It’s such a great holiday for kids, less for adults unless you’re right out of college and doing the trampy costume party thing (which I somehow never particpated in). Next year I’ll have a little one to dress up- can’t wait! Yeah I think people mostly get into it here when they have their own little trick-or-treaters to take around. Bill Murray showed up at my Davidson friend’s Halloween party (Greg Mauer’s) in Brooklyn. Isn’t that crazy? !